Good-Win Racing RoadsterSport midpipes MAZDA - MiataRoadster - Stay tuned with MiataRoadster! The factory converter for the 1999 to 2005 Miata is a welded in part of the midpipe (California 99-00 Miatas also have second converter in the header assembly). 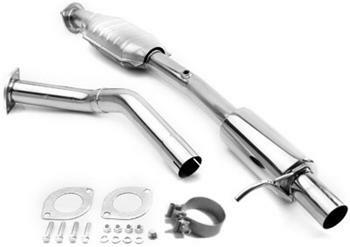 Complete your highflow exhaust system with this midpipe…this is the best BOLT IN midpipe available for second generation Miatas and includes a highflow converter and built in resonator! Full 2.5 inches from tip to tip in all stainless steel. ALL the mufflers we sell for 99-05 include only the muffler and not a midpipe (unlike the 90-97 choices). So if you want the flow to connect your new high flow header to your new high flow muffler here it is…for normally aspirated to supercharger or turbo (BUT does NOT fit MAZDASPEED). All stainless steel parts means years of quality performance and all the stainless parts have a lifetime warranty (300-cell ceramic catalytic converter used on all units sold in 2012 or later includes a 5 yr/50,000 mile manufacturing defect warranty on its housing and 25,000 mile defect manufacturing warranty on the internals). Not CARB approved and legal in California for offroad vehicles only that may never be used on public roads. To prevent engine codes this midpipe has O2 connection for factory O2 sensor AFTER the converter (see forum instructions). Not for use with Racing Beat’s lower rear chassis brace. INSTALL NOTES and CAUTION! Is your Ignition Coil weak or failing? The most common reason people buy this midpipe is that their Miata midpipe converter has failed after 50,000 or more miles. The owners too often assume the failure is simple old age, when in fact something else is failing. Failing items such as coils, fuel pressure regulators, spark plugs, valves, plug and ignition wires, and improper ECU calibrations, can cause the engine to misfire and dump raw fuel into the catalytic converter, which will cause over heating and a meltdown in the converter, and is not a manufacturing defect in the converter. If you simply replace the midpipe and don’t fix the failing car then you can expect to quickly kill any replacement converter and that replacement will NOT be a warranty replacement. Therefore, please have your car professionally inspected and repaired BEFORE you install your new midpipe.